Ten years ago, China was busy studying latest innovation from USA and applying these to local environment (Google->Baidu, Facebook-> Renren). Many USA companies were “outsourcing” manufacturing, engineering to China. Ten years later, we start to see a reversed trend: manufacturing jobs are moving back to USA, big powerhouses in China now go west, and in some areas technologies and adoptions have leapt ahead of the west (mobile payment, O2O service models). Coming to the year of 2017 there is continuous growth in multiple industries, from Sharing Economy, Self Driving Car, to Fintech Revolution and Artificial Intelligence. What are the trends and opportunities during this movement? What kind of collaboration will be happening between US and China? What career and business opportunities are there for professionals and entrepreneurs? You are invited to join us and meet with our distinguished speakers and learn some great insights from them. Evening VIP Dinner reception is invitation only and there will be separate ticket distributions. Please contact organizers for inquiries to VIP Dinner. 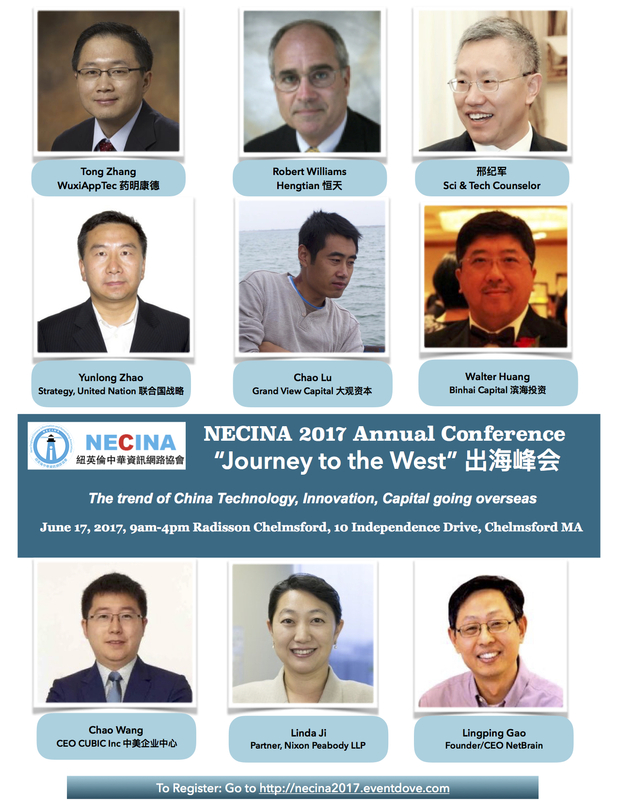 Interviewed by Tony Tian, President of NECINA and Partner at Kendall Venture. “跨境的生物科技投资与孵化” - Walter Huang 天津滨海投资公司总裁"
Click here to view detailed speaker bios.